I heard Ma come out onto the porch to look over the flock. "There's Thanksgiving dinner Mayme." Pa pointed right at "him." A warm feeling came over me and I looked right at him and smiled sweetly. "Oh no, I don't want to kill him,' I heard her say, " he's too grand. We'll use one of the other ones." Then I swear I saw him smile at me. I had to do something, it was near June and he'd be in his second year and as big and mean as he could be. I doubted I could live through a third year. "Ma," I asked that night, "why can't we have that big ol' turkey that's mean for Thanksgiving? He'd be the tastiest one." I tried to look as pitiful as I could but it did no good. Ma made the decisions as to which turkey stayed, or went to the big pot. She called all the shots as to when the chickens, ducks and rabbits went too. "You know we can't eat the best of the flock now don't you? We need him to make sure we have good turkeys for next year. His chicks will be as big and pretty as he is." The thought of 20 more just like him gave me a sudden chill. I was gathering the eggs one afternoon when around the hen house came that turkey. He spied me and came on the run. His wings stretched out wide as he ran, and he looked like he was a real bat with those wings hanging out like that. I dropped the eggs and ran. I got the dickens for breaking the eggs and being a baby for being afraid of a lil' ol' turkey. I hunched over breakfast under a black cloud as Pa told me for the 10th time to "just walk right out there, he won't do anything as long as you act like the boss. Don't be such a baby." I knew that was not true but I nodded just the same. I started carrying my switch everywhere I went and he stayed out of reach. 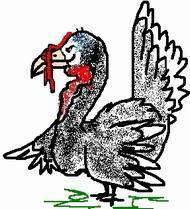 The other kids laughed at me because I was afraid of a turkey. He got me at the hen house a couple more times, but I didn't drop the eggs, I kicked and yelled and swung my fists at him. I ran and hid in the barn until he was gone. I took my dog Bruno with me one time when I gathered the eggs. The old turkey came flying down out of a tall pine and Bruno run like anything with that turkey ride'n square on his back. 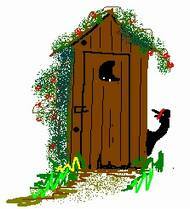 I even jumped in the outhouse once and had to stay there for a long while. I knew I had to get the best of that turkey but I really didn't know how. I couldn't go to ma or pa, they'd just tell me not to be a baby and get back out there. I don't believe they ever saw him jump on me except for that one time. One evening my grandad came to sit and talk a while on his way home. I sat leaned back against the porch step listening to his tales. He and I were special friends and I loved him. I always loved his stories particularly when he told how he used to be a muleskinner on the big freight wagons. How he'd sail that big blacksnake whip out over the mules and pick a horsefly off'n the hame. How it'd crack and pop as he shouted, "Pete! Maud! Haw mule!" At that moment an idea of such cleverness and of such craftiness that was ever thought of somehow leaked into my head. I let it sit in there gleaming like a new penny, bright and wonderful and a grin spread from ear to ear. My heart was racing and thundering in my ears. "Grandad," I said getting the old man's attention. "Grandad?" He looked toward me and puffed again on his pipe. "What is it child," he said. Would you come by tomorrow on your way home from town, please?" "Oh I'd just like to talk with you that's all. I want to hear more stories." It wasn't really a lie, but it wasn't the real reason I wanted him here tomorrow either. "What story do you want to hear?" he had a puzzled look on his face. Pa broke in, "You've been hearing stories all evening, don't ask him to make a special trip up here tomorrow." Granddad said, "Well, now, now, that's fine, I don't mind, course I'll be here." He was proud that I wanted to spend some time with him. I felt a little guilty but I kept going. That's good Grandad, I'll be waiting, what time do you think you'll be by?" I wanted to know the precise minute if I could get it. "Well, should be about half past two I suppose." I smiled real big and hugged him. I was happier than I'd been in a long while. The following day I kept my eye on that ol' turkey and the clock. If he wandered too far from the house I'd go out and stomp my feet causing dust to fly. I'd wave my arms to irritate him, anything to keep him riled and close.